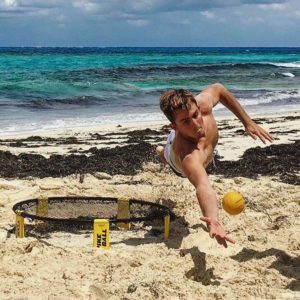 You still have time before summer starts to pick up Spikeball, the addicting sport that has taken over America’s lawns and beaches. Intensely competitive, Spikeball is similar to volleyball, but you can literally play it anywhere. All you need is a Spikeball set and a few friends. You might have seen Spikeball on Shark Tank in 2015—but Spikeball CEO Chris Rudder actually started playing back in the 80’s after buying a set from Toys’R’Us. It only makes sense that Spikeball was born in the same decade as Mario Brothers (wahoo!). In 2008, after playing for 20 years, Chris bought the rights to Spikeball and started selling the sets online. By 2013, Spikeball sales topped over $1 million and Chris was focusing on Spikeball full-time. Go to any college campus, beach, or tech startup and you’ll be sure to see Spikeball being played on the regular. There are 1,500 official Spikeball tournament teams and hundreds of unofficial lawn leagues. In fact, at the Grow headquarters, we play Spikeball about 5 times a day. With thousands of die-hard Spikeball fans all over the world and over 3,000 retail locations, you could say that Spikeball has started the next sports revolution. With all this growth, the Spikeball team needed real-time visibility on their ecommerce and shipping data and turned to Grow as a business intelligence dashboard solution. Grow is beyond lucky to partner with Spikeball as they dominate the online sports world. Next time you’re looking for a daily hobby that will steal all your free time, look no further than Spikeball.